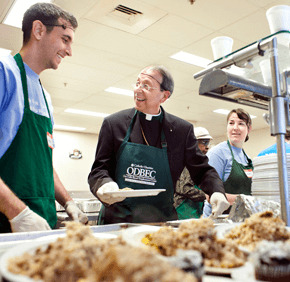 On his first day as archbishop of Baltimore May 17, Archbishop Lori piled plates high with casserole at Our Daily Bread Employment Center, an outreach of Catholic Charities of Baltimore that provides hot meals and employment services for people in need. It was lunchtime, and people waited in line for their food, which that day was a choice between macaroni and cheese or chicken and rice casserole. Wearing a hairnet and green apron, Archbishop Lori served food with other volunteers, including a group from Morgan Stanley’s Baltimore branch. Baltimore’s largest meal program for people in need, Our Daily Bread serves an average of 700 people daily with food donated from the community, including local Catholic parishes. On the day of the archbishop’s visit, the casseroles served were prepared by parishioners of St. Mark in Catonsville and Church of the Resurrection in Ellicott City. Our Daily Bread Employment Center director Sabree Akinyele took Archbishop Lori’s visit so soon after his installation as a sign of his support for Catholic Charities’ mission, she said. Longtime volunteer Anne Shelton, 70, said Our Daily Bread plays a vital role in the community, and was glad Archbishop Lori made a point to see it. “There’s so much need in our community, and the fact that he recognizes that and knows that this is where the heart of the community is – in services like this – is beyond words,” said Shelton, a parishioner of St. Joseph in Cockeysville and this year’s recipient of Catholic Charities’ Distinguished Service Award. “There’s a dignity here, everyone is respected and treated with the greatest dignity,” she said. After serving lunch, Archbishop Lori toured the facility, which includes Christopher Place Employment Academy, which provides housing and job skills to previously homeless men. Archbishop Lori met several of the participants, remarking after shaking their hands that he could tell the men had self-confidence. 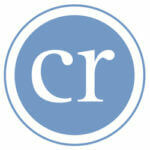 As archbishop of Baltimore, Archbishop Lori is chairman of Catholic Charities of Baltimore’s board of trustees. The organization operates more than 80 programs throughout the archdiocese that address the needs of children and families, the poor, the elderly and people with developmental disabilities. After touring Our Daily Bread Employment Center, Archbishop Lori visited Esperanza Center in Baltimore, which provides services to immigrants. William McCarthy Jr., executive director of Catholic Charities, said that it was a priority for Archbishop Lori to see some of Catholic Charities’ work on his first day, and McCarthy chose to highlight its outreach to homeless people and immigrants. He expects the archbishop to visit its other programs throughout the summer. McCarthy hopes that under Archbishop Lori’s leadership, Catholic Charities will “continue to serve our brothers and sisters in need” and “continue to be relevant in terms of meeting needs that aren’t being met elsewhere,” he said.